Forum Index > Off-topic Talk > Strange question regarding war elephants in a game. Posted: Tue 27 Nov, 2007 11:15 pm Post subject: Strange question regarding war elephants in a game. I was, years ago, a huge fan of the original Medieval: Total War game series. They seemed to have put some decent research into the game and while I have not played in forever, I'm pretty sure all of their stuff is solidly bound. They produced a sequel on a better engine called Medieval II: Total War. They basically make it more "alive" by replacing the chess-like army tokens with animated ones, and add a few features. They also expand the scope of the game to go to the 1500's, during the early colonial period in the New World. I never played much of the Campaign (other things calling my attention) before I was invited by a clan mate to do a skirmish game. In this fictional scenario I played as England with access to all of England's troop types in the game. It all seemed pretty solid and goes up to the Arquebus in terms of weaponry. I was to defend a castle in the scenario, against some middle eastern (forget the name) faction played by my clan mate. The battle begins and he bombards me. Now, I'm no expert on medieval warfare (which is why I'm here, learning), but it seems VERY odd to me that you would see something like that. In fact, I'm pretty sure it's a fantasy contamination of history. So, my strange question is: Did someone invent MRLS elephants at some point in history? Strangely enough, that rings a bell. In "The Mongol Warlords", Nicolle states that some of the elephants in the army of the Delhi Sultanate, at the time of Temur's Indian campaigns, were equipped with incendiary devices. He doesn't describe the nature of these incendiaries, and he cautions that these installations may have been placed in the howdah, but they may also have been set on the ground around the elephant. The total war series were not always very close to the truth, in Rome, there were a lot of things drawn out of proportion or simply not true (like the extensive use of warhounds, incendiary pigs and Arcanii). I do not recall elephants in the mongolian army. The Arcanii actually existed, but were an intelligence service in Britian, and not a very good one it seems, rather then a set of ninja. I've heard about camel-mounted guns like the zamburak ( http://en.wikipedia.org/wiki/Zamburak ), but not about elephant-mounted ones. The closest thing I'm aware of are the bolt-shooting engines (large stand-mounted crossbows, so to say) placed on the backs of elephants in the wars between mainland Southeast Asian principalities like the Khmer and the Cham. It sounds suspect to me, how would they fasten a cannon on the back of an elephant and then expect the beast, even with training, to withstand the noise and shock? I'm sure there's somthing along those lines that exsisted, but a full sized cannon, no, I highly doubt it. As has been said, the TW games may be above and beyond accurate when comparing them to other games, but they do mess up or "change" stuff sometimes. Still, they are the best thing to happen to "historically accurate" games in the history of gaming in my opinion. I'm embarrased to say, but the first time I heard of the Byzantine empire was thanks to Medieval: Total War. Thanks to that game I've become interested in that culture and a few others, proof that TW games rock. EDIT: Oh, you said rockets, well I have no idea then, cannons would be hard to explain away, but rockets might be possible? I don't see how it would be a good use of an elephant though, seems balista and archers would work better on an elephant... I seem to have added nothing to the discussion, it happens alot with me, lol, sorry. 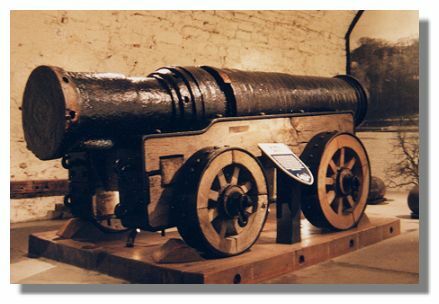 A canon might be more something of the size of a wallgun or swivel gun something in the 1/4 pound to 1 pounder shot weight might be possible !? A deaf elephant or a very " calm/trained " one might help. I can also see more problems than advantages to using elephants or any other animal to carry/shoot canon ! A warcart as a gun platform makes more sense to me. I could see an elephant used to move the cannon into position, similar to civil war era use of horses to move equipment. Maybe that is closer to what could have been done. But one thing I have encountered with elephants in warfare, they were used in many different ways, their shock value seems to have been immense. Even if they are not used as shock forces, everyone on the battlefield better know where they are!! Looking at the history of war elephants in general (and I have been doing that a lot recently), I sometimes wonder why the ancients didn't find ways to rectify some of their more obvious weaknesses. In particular, I wonder how practical it would have been to deafen or "sound-blind" an elephant, and to shoe it with metal. How would you shoe an elephant? I don't think you could strap one on as it would wear away at bad moments, and you can't simply shoe it like you would a horse. Tamerlane was known to use caltrops against elephants, so I doubt they'd be shoed, as his tactic worked. He also used camels with flaming cauldrons on their backs (reminiscent of the Romans and flaming pigs, IIRC) knowing that elephants have an aversion to fire. That said, rockets seem unlikely. I read in a biography of Nader Shah that the Moghuls had elephant-mounted guns (I think more along the lines of swivel-gun than all-out cannon). I'll go check it out again from the library tomorrow to verify that. But for the Medieval Total War II time period, the idea is fairly unreasonable. Cannon were fickle in 1400, and a cannon on an elephant would essentially have made for a large, expensive barbeque. It's designed for horses, but just maybe it could be elephantized. No, you can't shoe it like you would a horse, but the idea of a strap-on shoe as a defense against the omnipresent caltrops just seems like a good idea. There must be some reason cultures didn't use strap-on shoes as a defense, but I have not come on it to yet in my readings. Elephants are a fairly new fascination of mine, and it may be about 600 years too late to learn anything of value . . . . . Need to learn more about elephant locomotion, i think . . . . . .
Everytime I see an elephant I think.... man an army of those would be pretty amazing. I agree they have their weaknesses but man still would be a sight to see. I cannot see cannons on their backs but rockets.... perhaps. They could be quieter than cannon fire. From what I remember rockets were just used to set things ablaze and for confusion/distraction but were of little use killing people in and of themselves. I hear the chinese used rockets that rested on their shoulders so if that could be done I could see a small tower of carrier devise set on their backs. That said in reality I have never heard it used on elephants backs. I figured cost. Shear weight causing wear and tear too often to repair properly. I cannot see cannons on their backs but rockets.... perhaps. And any excuse to go to the zoo is a good excuse! I was not implying that swivel guns were out but cannons. Sorry, I just think of anything bigger than an arquebus as a cannon, I'm sure that's not correct though...What would the correct term be for swivel guns? Not my area of expertise, that's for sure. The term swivel gun usually refers to a small cannon, mounted on a swiveling stand or fork which allows a very wide arc of movement. Just a semantic misunterstanding, then. True, in the end it was less about the term and more the idea of a cannon I had in mind. In the medieval period anything can be called a gun as well. When I think of cannons I am thinking about something that could not be moved by a human by himself. Most swivel guns could be moved alone. What I had in mind. Note moved not used alone--- I cannot imagine using a swivel gun without a support. In the end it is just difficult terms as hand guns oftena re called hand cannons as well.